Chad got his start as a fantasy football writer years ago at Jim Day’s GOAheadScore.com website. After refining his craft through dozens of articles, Chad started his own podcast, Under the Helmet, and found his way to the dynasty section of ProFootballFocus.com Fantasy. In addition to rankings and articles, Under the Helmet became the weekly dynasty show for the website with co-host Scott Spratt. 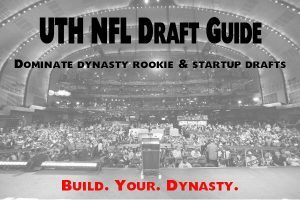 Chad started with Footballguys.com writing weekly game recaps, progressing into a staff writer position where his feature articles for dynasty, redraft, and daily fantasy football can currently be found. Chad prides himself on seeing as many dynasty trades and rosters as possible. Knowledge is power. In addition to railing against premium purchases of older players and overpaying for positions deemphasized by a league’s format, Chad’s excel database of historical data, studies, and probability grows by the day. Projecting college prospects for fantasy is Chad’s pet project where he has tracked all drafted skill position players dating back to 1999, fueling the results-driven projection model for quarterbacks, running backs, wide receivers, and tight ends which drives initial rookie valuations for dynasty and devy. The podcast has been Chad’s pride and joy over the years, gaining market share in the dynasty landscape along the way and never missing a week since 2011. After having just a handful of guests in the spring of 2013, Doug Veatch garnered a great response from the listeners and the pair had instant chemistry. After a few more appearances in the following months, Doug joined the show full-time until 2016. 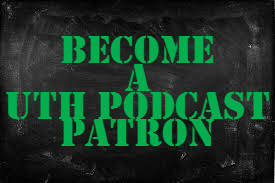 Since 2016, Katie Flower, Tim Torch, and Jordan McNamara have joined the regular rotation of co-hosting duties, including driving content on the premium podcast side of UTH. All three have been outstanding resources for dynasty strategy, fostering new ideas for dynasty evaluation since joining the UTH family.